I feel very fortunate to follow my life's path and long time dream as being a full time artist. My passion for the arts has been with me every since I can remember and started at a very young age. I am very excited to be able to share this part of myself to you. 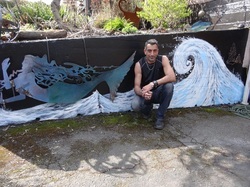 Besides being very versatile as an artist, painting wall and window murals is the direction I have decided to take. Every day and new job is a learning process for me, I love trying new things and welcome all the new challenges. I am especially happy when I know my mural paintings bring joy to those who view them and the owners who have commissioned the work from me.